eero Home WiFi System (1 eero .. 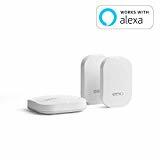 WHOLE HOME WIFI SYSTEM: The eero WiFi System (1 eero 2 eero Beacon) replaces the traditional WiFi router, WiFi extender, and internet booster by covering a 2-4 bedroom home with fast and reliable internet powered by a mesh network. 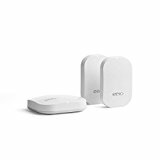 eero SECOND GENERATION: With the most intelligent mesh WiFi technology and powerful hardware, the eero 2nd generation WiFi system is 2x as fast as the original eero WiFi. Backwards compatible with 1st generation eeros. 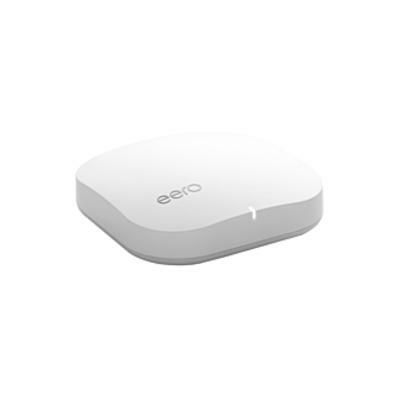 WIFI EXTENDER: The eero Beacon is a full-fledged WiFi access point that simply plugs in to standard outlets and easily extends your WiFi connectivity to every device with more reliability than the standard WiFi booster. MESH NETWORK: Powered by proprietary TrueMesh technology, the eero mesh WiFi network leverages multiple wireless access points to create an incredibly dependable internet experience, all on a single mesh WiFi system. QUICK & EASY SETUP: Replacing your old WiFi router has never been easier than with the eero Whole Home WiFi System. Set up takes minutes and the companion mobile app makes managing your home WiFi simple and intuitive. Altitude operating: 3000m Ideal for most homes, this system comes with an eero and two eero Beacons that seamlessly cover the typical home in fast, reliable WiFi. It’s simple to set up. Easy to manage. And gets better over time with new features and improved performance. eero is WiFi you never have to worry about. Ios requirements: device running iOS 8.0 or later, Android requirements: device running Android 4.3 or later (tablets included) both eero and eero Beacon are powered by TrueMesh, the software and mesh routing algorithm at the core of the eero system. It’s the next generation of wireless mesh technology, custom-built from the ground up to work perfectly with eero. Taking full advantage of the hardware, it means that your WiFi is not only fast and resilient, but also intelligently adapts to your home.